If you follow us on facebook, twitter and/or instagram, you may have noticed a few photos of a new design popping up lately. I am VERY excited about the launch of our new Feisty Floral Watercolour design, available in two different colourways and in a whole array of different products. And at the same time, we are also introducing new cushion sizes and shapes in this design, as well as across all our other new range designs. We can now offer you cushion covers to fit a 40cm x 40cm, 50cm x 50cm, 60cm x 60cm and a rectangular shaped 40cm x 60cm cushion inner. The Feisty Floral Watercolour design is particularly special to me as I had originally hand painted it and then printed it onto fabric using a silk textile screen a few years ago. I had actually hand painted and printed several versions of it onto various bits of fabric, which I was always going to one day make into pillow cases, tea towels and possibly napkins for myself. I had actually forgotten about the fabric sitting in one of my storage boxes from my Dublin days, and when I did a little clear out and found it, I decided I HAD to add it to my collection. I wanted to keep the hand-painted effect, but without actually having to hand paint it onto many many metres of fabric myself, so I decided to scan in the printed fabric at a very high resolution and then print it digitally back onto a base fabric. As you can see it has kept the grainy watercoloury texture beautifully, and with the help of photoshop I was able to create and offer an alternative colourway. The beautiful thing about his fabric is that each item is cut from the fabric as we need, so every product will have a unique crop of the design on it, and no two pieces will be alike. 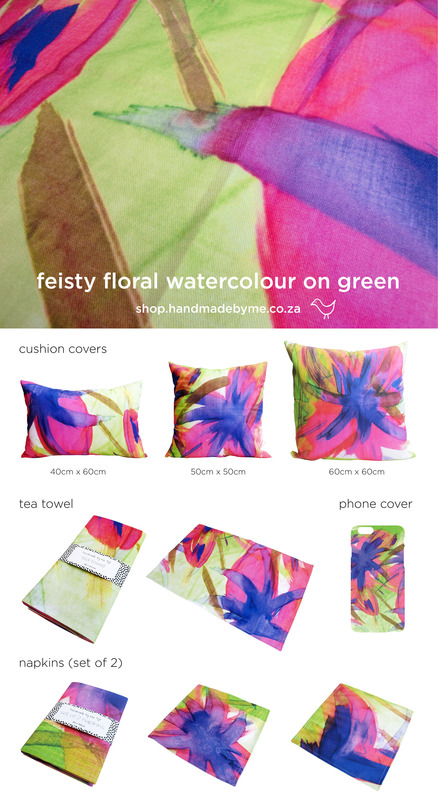 Introducing my new Feisty Floral Watercolour design, available on blue and on green. It’s like I referenced them without even knowing they existed!! I am definitely going to have to get me some of these for my home now! 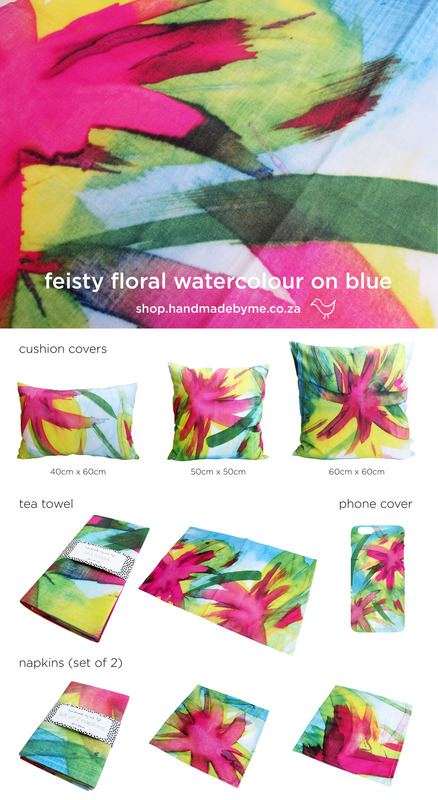 All the above products have been printed and handmade locally here in South Africa. For more information on each of the products you can visit the Handmade By Me online shop. And for a sneak preview of the products themselves head over to SAM (South African Market) where we have our first batch on display. If you are a shop or stockist, we have a new catalogue out for 2015, please get in touch if you would like us to send you a copy. 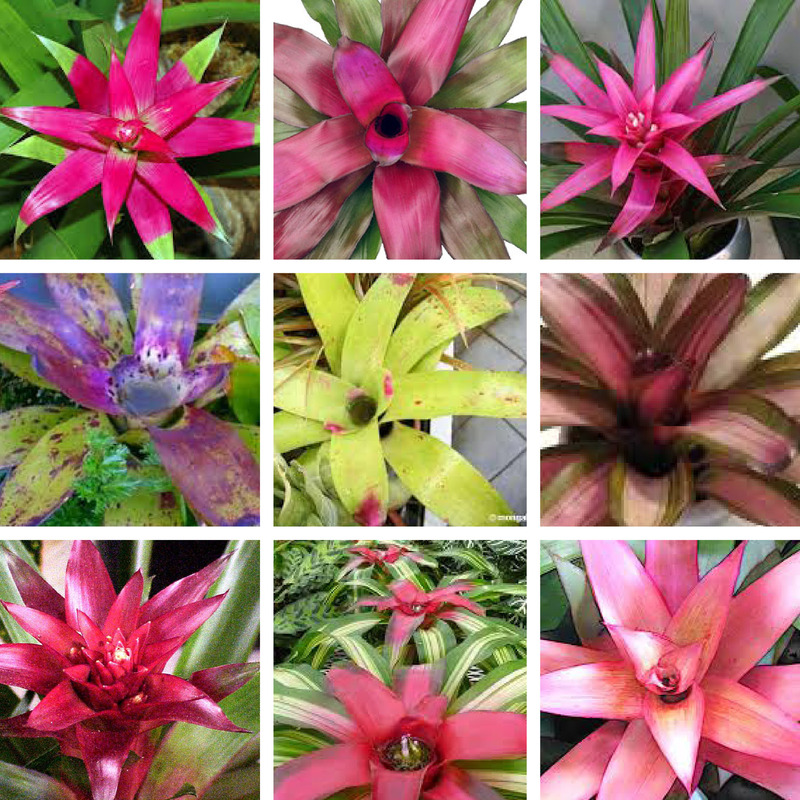 This entry was posted in fabric design, new products, shops stocking handmade by me, Uncategorized and tagged art, bright, bromeliad, brush stroke, buy, colourful, cushion, design, dye, fabric, feisty, floral, flower, green, handmade, napkins, new, online, paint, painting, phone cover, pineapple, pink, plant, print, shop, tea towel, texture, watercolour by seraholland. Bookmark the permalink.